Supplementing proven commodities with young, upside players is a great way to find a winning combination of safety and ceiling. Finding potential breakout players before your leaguemates is one of the most rewarding parts of playing fantasy football. Not only does it help your team become more successful, but these players often come at affordable prices on draft day. While we’ve already seen the Lions tight end exhibit some success in the league, one could argue he still has yet to definitively breakout. Last year’s free agent acquisition of WR Anquan Boldin was a major road block to Ebron’s success. After cementing himself as a reliable checkdown option in 2015, Ebron’s role changed with Boldin taking over those shorter routes. 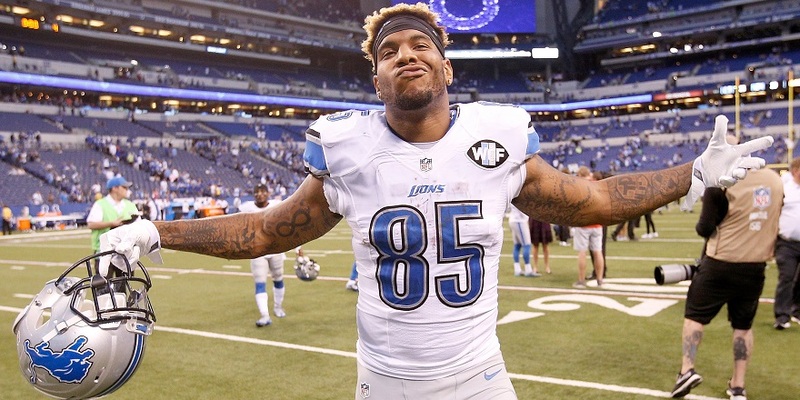 Ebron’s average depth of target climbed from 6.2 yards in 2015 up to 8.5. Boldin took over Ebron’s 2015 role finishing with a 6.6-yard aDOT — bottom-five among all wide receivers. Boldin also grabbed a team-high 23 red-zone targets compared to Ebron’s six. Boldin’s shorter routes were often quick reads for QB Matthew Stafford, and it led to Boldin outscoring Ebron 6 TDs to 1 in the red zone. With Boldin out of the picture in 2017, it’s not unreasonable to project Ebron back in that short-yardage, chain-moving capacity with touchdown upside. Ebron led all tight ends in routes run per game in 2016 and has a strong chance to gain those targets Boldin was seeing last year. Entering the league at just 20 years old, Ebron has continued to see growing production as his receptions and receiving yards have increased each season. The arrow is pointing up for Ebron, and after scoring just one touchdown in 2016, it’s difficult to fathom his ADP rising much more than his current cost in the 10th round. Doyle was highly efficient as the Colts No. 2 tight end behind Dwayne Allen last year. Doyle signed a three-year, $19 million contract to stay with the Colts and Allen is now in New England. 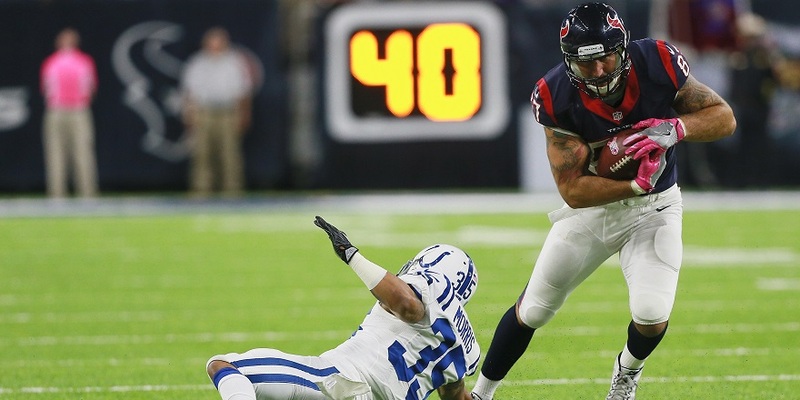 Doyle now gets a chance to showcase his talents as the top tight end in Indianapolis. Doyle finished as TE13 last season, posting a 59-584-5 stat line. He posted five top-12 weeks while picking up the 14th-most red-zone targets among tight ends (13). His 0.40 PPR fantasy points per opportunity ranked 15th-best, tying fantasy stalwarts Greg Olsen and Jimmy Graham. Doyle also finished top-10 in Jeff Ratcliffe’s Touch Opportunity Volatility rating, a surprisingly high number considering he only played on 68.4 percent of the offensive snaps while splitting time with Allen and the emerging Erik Swoope. Doyle and Swoope figure to make a fantastic 1-2 punch for the Colts at tight ends, a team that ran the third-most plays out of “12” personnel (one back, two tight ends, two receivers). Indy has finished as one of the most pass-happy teams in the league each year since QB Andrew Luck was drafted, and outside of Luck’s rookie year, the top tight has seen a target share of, in order, 12.8, 13.7, 13.9, and 15.1 percent, finishing as the respective TE13, TE19, TE7, and TE14. Doyle is currently being drafted in the 11th round as TE13 and looks to have a strong chance to join that cohort with fringe TE1 weeks while serving as a high-performing TE2. Fiedorowicz may have broken out in minor fashion last year, but current drafters are overlooking him once again in 2017. Fiedorowicz has a chance to truly emerge on the fantasy scene in a breakout campaign this year if he’s healthy and able to play all 16 games. Last year, he finished with six top-12 weeks (tied for eighth-most) and three top-six weeks (tied for ninth-most), despite not getting involved much in the offense until Week 4 and missing a game in Week 15. He went on to accrue at least seven targets in nine of his last 12 games. Only three tight ends had more games with seven-plus targets over the course of the entire season. That type of volume makes it astounding to me that more people aren’t looking his way in current fantasy drafts. Fiedorowicz is currently being drafted TE20, after three questionable picks in O.J. Howard, David Njoku, and Austin Hooper. Fiedorowicz put up 0.47 PPR fantasy points per opportunity last year, tied for the sixth-highest rate in the league. He ranked seventh in yards per route run (1.98) among all tight ends with at least 30 targets. Nobody targeted the tight end more than Houston while trailing in games last year (33 percent) and the Texans failed to add any competition through either free agency or the draft. If you miss the early run of top-performing tight ends, Fiedorowicz is a fantastic safety play to target in rounds 13-14 with legitimate top-12 upside. Let me preface this by saying it’s very difficult for rookie tight ends to become fantasy relevant. Despite an increase in league-wide passing trends, there have been just two rookie tight ends that have accumulated 600-plus receiving yards over the past 18 seasons. It’s just very rare and exactly why David Njoku or any other rookie tight end hasn’t appeared on this list. Cleveland head coach Hue Jackson kept playcalling responsibilities last year. Dating back to his Cincinnati days, his top tight end has seen 81, 72, and 79 targets. Those tight ends have finished TE14, TE6, and TE19. Despite a largely disappointing year, Gary Barnidge still managed to finish with five top-12 weeks in 2016. The one-hit wonder was released following this year’s draft and DeValve is expected to play a key role in 2017. The unfortunate part about DeValve is the lack of potential touchdown opportunity. The Browns averaged just 2.8 red zone trips per game last year, tied for the 29th-fewest in the league. However, game script doesn’t appear to be in Cleveland’s favor and we could expect a bump in tight end usage with the return of a healthy QB Cody Kessler. When Barnidge and Kessler both played, Barnidge averaged 9.44 PPR points per game, a 151-point season pace that would’ve netted Barnidge a jump from TE19 up to TE12. DeValve is free in drafts right now, currently not being drafted enough to even register an ADP inside the top-35 at the tight end position. The Browns are projected by Vegas for just 4.5 wins and passed the ball 63.7 percent of the time last year while trailing in games. DeValve’s touchdown upside may be capped, but he has garbage time receiving potential written all over him. In deeper leagues, DeValve could potentially emerge as a top-24 option given Jackson’s track record coaching the position and the Browns tendency to pass the ball (fourth-highest in the league).